Firmware updates are bug fixes and functionality enhancements for the router. Keeping the firmware of your Linksys device updated is important because it fixes issues you may encounter while using it. An updated firmware downloaded from the Linksys Support site may also contain device feature enhancements that are not available in the previous versions. Your router is capable of either an automatic or manual firmware upgrade. This article will show you steps on how to manually upgrade your Linksys Wi-Fi Router's firmware. If you are using a Linksys Smart Wi-Fi Router, click here for instructions. IMPORTANT: To prevent upgrade failures, the following items must be checked before proceeding with the upgrade process. Use a wired computer for stable connectivity. It is NOT recommended to update the firmware via Wi-Fi as it may cause permanent damage to the router. Use another browser if your default browser does not work. Alternatively, you can use another computer to perform the upgrade. Download the correct firmware and version for your device. If you have a storage device connected to the router, make sure to remove it before upgrading the router’s firmware to prevent data loss. Make sure that you have created a backup configuration. For instructions on how to create a backup, click here. NOTE: Steps and images may vary depending on your router's model. You should find the model number and serial number on the router's label at the bottom. NOTE: Identifying the appropriate model and version number will help download the correct firmware. If your router has no version number, this means that your device is a version 1 model. To learn how to find your device's model number, click here. Download and save the firmware from the Linksys Support Site to your preferred destination folder (i.e., Desktop, Downloads) in your computer. If you need more help in downloading the firmware, click here. NOTE: The firmware format is .bin, however, some may have a different extension such as .img and .bix. Launch a web browser and enter “192.168.1.1” in the Address bar then press [Enter]. If the IP address does not work or if it has been changed, check your router's local IP address. For instructions, click here. Enter your login credentials. The default password is admin. If you changed or personalized your password, use that instead. Click on Administration > Firmware Upgrade. NOTE: Some routers have a Choose File button. 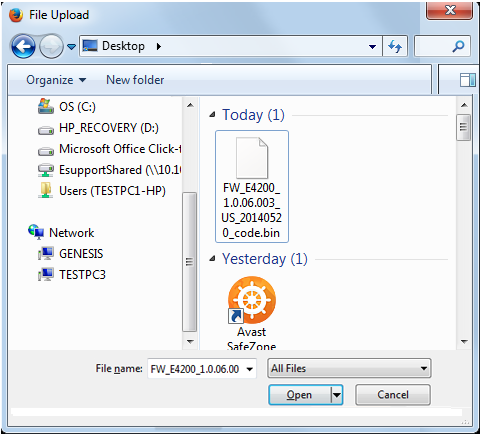 Locate and select the file that you have downloaded then click Open. NOTE: If you are using Mac OS X®, click the Choose button. Click the Start Upgrade button. NOTE: Some routers display Upgrade only. IMPORTANT: Do NOT turn OFF the power or press the reset button of the router during the upgrade process. If you have selected an incorrect file, a prompt similar to the image below will appear. If this happens, click the OK button and repeat Steps 2 to 4 and select the correct file. Click Continue when it prompts that the upgrade has been successful. Turn the router OFF then turn it back ON. You should now have manually upgraded the firmware of your Linksys Wi-Fi Router.